February 2019 will mark my tenth anniversary of making a move from South Florida girl to proud ATLien. In the last decade, I have witnessed the city crawl out of the recession and explode into a southeastern powerhouse of culture, cuisine, and career opportunity. While we didn’t land HQ 2, our outlook still looks bright, but sustaining our success will require our city to continue to attract top talent to fuel our economic engine – and we need the help of our people – our civic “employees” – to do it. If you’ve been following this blog for a few years, then you may recall that I am a City of Atlanta fangirl. I first profiled the Choose ATL campaign back in 2015 here and had the opportunity to speak with the woman leading it all on a FOT podcast here. In short, Atlanta has built an employer brand around our heart and hustle spirit and has run a leading content-rich marketing campaign to target emerging talent in neighboring growth cities to bring their skillsets to Atlanta. Last week at the annual Metro Atlanta Chamber’s (MAC) annual year-end meeting, talent was at the center of the conversation again– specifically tech talent. According to the Technology Association of Georgia, over 5,000 new IT roles are posted online daily in the state. MAC president and CEO Hala Moddelmog, stated that strengthening that pipeline “through updated research and regional collaboration” and the launch of “tools to monitor and measure the region’s reputation” will be one of the Chamber’s 2019 priorities. The meeting closed with a call to action and launch of The ATL Brand Box, the Chamber’s latest tactic in positioning Atlanta as a career destination of choice – and employer brand leaders everywhere should once again take note. The online brand toolkit enables anyone to communicate Atlanta’s EVP through key messaging, photos, video, testimonials, and the personas that make up our neighborhoods. It’s actionable. 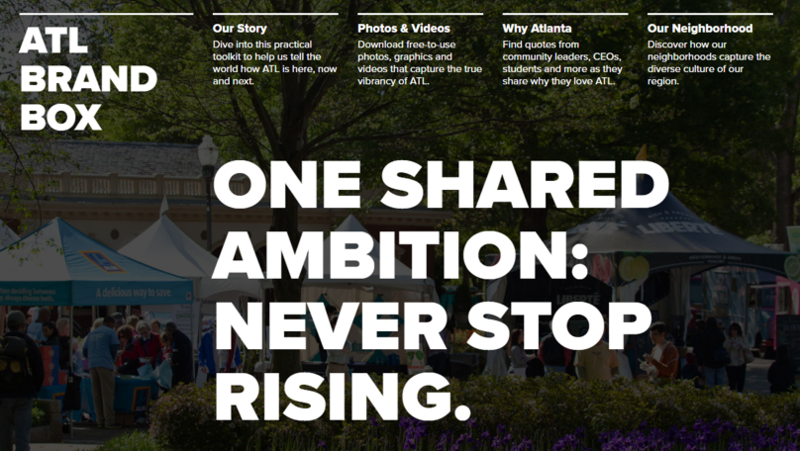 There is a shared rallying cry above the fold – never stop rising – with clear direction in the supporting navigation to dive in, download, find, and discover what makes Atlanta great. Atlanta advocates have the heavy lifting done for them in one streamlined and easy to navigate platform. It’s cheap to replicate. If you dig around on the site, you’ll notice that it’s a lightweight landing page with links out to Dropbox with Word docs and what could easily be cell phone photography. Any shop with an iPhone and a modest employer brand budget can get a solution like this off the ground. It was launched with the right stakeholders in the room. CEOs from Atlanta OGs like UPS, Delta, and The Home Depot, in addition to new brands fueling our growth including BlackRock, Pandora, and Thyssenkrupp attended the MAC annual meeting – all with a shared need to continue to attract and develop Atlanta’s talent pipeline. If you get leaders across your business in the same room, my money is on talent once again surfacing as a shared need. I’m proud that I packed up my 2006 Saturn and took a chance on this eclectic city. Metro Atlanta is here, now, and next – and we are armed and ready to share our story.